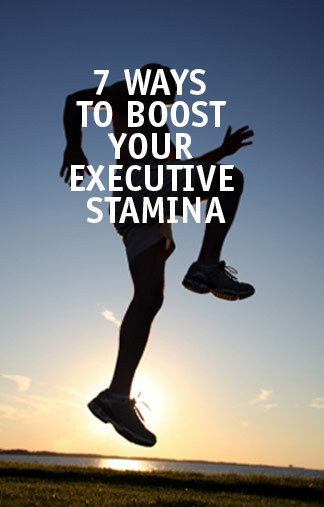 Executives need stamina to remain consistently focused on and energized about the task at hand. Getting too tired, busy or stressed also increases your chances of making career damaging mistakes. In “Executive Stamina” (John Wiley, May 2008) you’ll learn the skills and systems necessary to create a sustainable path to achieve your full career potential. You may have a mental job but rising demands and complexity also make it a physical job. Being fit yields energy, mental clarity and stress fighting benefits. See it as part of your job and schedule fitness activities into your day. Using progressive techniques, like interval training, you can gradually develop higher levels of fitness and expanded endurance. Eat more medium Glycemic Index (GI ) foods during your work day. The best way to sustain your energy and focus throughout the day, without drop-offs, is to eat foods that provide steady levels of calories to your system. Medium GI foods release an even supply of two calories per minute to your brain and muscles. These include brown rice, whole grain breads, cereals and pasta, baked potatoes, and many fruits. Eaten in combination with high protein, low GI foods your body and mind will remain on an even keel. Too many high GI foods, like doughnuts, white bread, honey, corn syrup and candy will deliver a lot of calories to the bloodstream quickly but will also trigger steep dips in energy later on. The positive kind of multi-tasking: Executives often have so many professional and personal commitments that it makes sense to creatively achieve several goals with one activity. – Getting your team to participate in a “sweat equity” project, like Habitat for Humanity home building, which combines teamwork, networking, mild exercise, and corporate citizenship goals. – Taking a nature walk with your family with the goal of studying the impact of climate change on streams in your region. This combines goals of fitness, family relationship building, contact with nature and environmental awareness. Your sweet spot is the meeting place of what you are good at, enjoy doing, have a deep interest in and is also aligned with your values. Spending more time in your sweet spot means higher energy, less stress and greater satisfaction from your efforts. Why let stress build up the entire day contributing to reduced emotional control and a decline in interpersonal skills and decision making? Develop stress management techniques like positive self talk to reduce anxiety and anger; slow, measured breathing to induce calm and centering; and yoga stretches that you can do at your desk to break up tension and tightness. Mastering these skills, that can be used in as little as 30 seconds to several minutes, will increase your confidence and sense of being in control. Top performing executives not only can tell you the activities that are the best use of their time, they are relentless in making sure that they spend the bulk of their time on these pursuits. A useful way to sort out your priorities is to create 3 “buckets” of tasks: Nice to do, Need to do, and Need to do Well. – Nice to do tasks can be delegated or even ignored if you are too busy. – Need to do actions have to be done but they can be completed in a “good enough” fashion, not perfection. – Need to do well activities should be your main focus and get your top effort. If you don’t have a plan for your time someone else will. If you have a difficult time saying NO and give too many quick Yes’ you may over commit and not even accurately estimate the time involved in what you just committed to. Soft No’s give you time to think through commitments or keep them smaller in scope. They also allow you to maintain your reputation as a helpful colleague. The cumulative effect of developing these Executive Stamina skills is to increase the part of each day where you feel that you are exercising choice and are in control of your self and your calendar. Marty Seldman, Ph.D. and Joshua Seldman, are Co-authors of Executive Stamina: How to optimize time, energy and productivity to achieve peak performance. In Executive Stamina, you’ll learn all the skills, techniques, and positive practices needed to create a sustainable path to achieve your full career potential. Renowned executive coach Marty Seldman and endurance coach Joshua Seldman will introduce you to the revolutionary training system they’ve used with great success on top executives and endurance athletes. You’ll find hundreds of tips and tools that will help you maximize your career potential, while maintaining your health, staying in touch with your values, and avoiding costly tradeoffs in your personal life. Marty Seldman, Ph.D. is one of the world’s most experienced and successful executive coaches and is president of Seldman Executive Development Programs (www.seldman.com). He is the co-author of The Wall Street Journal bestseller Survival of the Savvy: High-Integrity Political Tactics for Career and Company Success as well as the author of Super Selling Through Self-Talk: The Ultimate Edge In Sales Success. As an organizational consultant, Dr. Seldman specializes in team building, conflict resolution, feedback systems, and skills and workshops in building and maintaining trust. He received his B.A. from Cornell University and his Ph.D. in clinical psychology from Temple University. Joshua Seldman is a highly respected cycling and fitness coach and a successful endurance athlete. During his professional athletic career, he was a twelve-hour and twenty-four-hour solo mountain bike champion. He was also a lead coach for Carmichael Training Systems and Lance Armstrong’s Tour of Hope cross-country ride. He received his B.S. in exercise physiology, specializing in sports psychology from the University of Florida. very good article. I feel the number 1 reason for lack of stamina is fitness which is only compounded by poor eating habits. More and more executives spend too much time eating out. I understand combining business with eating out but it is a overused tool. How about listening to a sales pitch while working out or going back to the good ole’ days of discussing business over a game of golf, tennis or squash? The CEO should be leading the way and the main driver of how business is done and how fitness is the key to everyone’s success.